Happy November everyone! I woke up so excited today when I remembered it’s November. For a school assignment Ad had to disguise a turkey so the pilgrims wouldn’t want to eat him. Kole and I may or may not have watched The Grinch last night. And I may or may not have slept in my Christmas pajamas. I asked Kenny the day after Halloween if we could put our tree up. Him: Are you kidding!? There’s so much we still have to unpack. Me: I know! We’ll unpack the tree! LOL. I love Christmas movies!!! Happy November/almost Christmas!! And I say put up the tree – blame it on your readers who are dying to see what that beautiful house will look like in sparkly lights! Ok, I know you’re up to your ears in boxes and all but some of us…no ALL of us are DYING to see pictures of your house!!!!!!!!!!!!!! I was just out to lunch with my daughter and we heard “There’s No Place Like Home for the Holidays” in the restaurant! 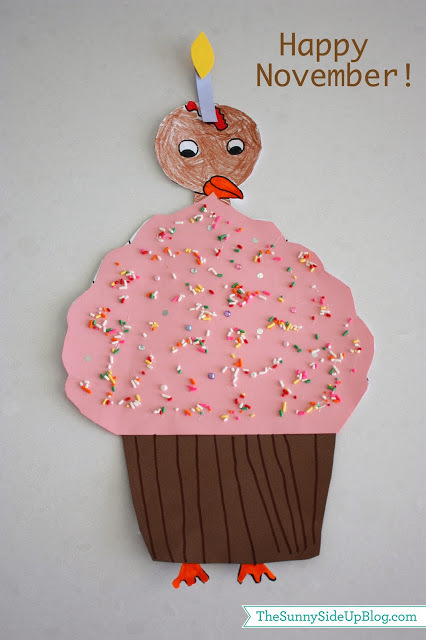 I did the turkey in disguise project with my 2nd graders when I taught, and I don’t think I ever got a cupcake-cute! That IS TOOO FUNNY…..go ahead, unpack the tree! SHHH, I am putting mine up this week! Be happy and enjoy everything! It all doesn’t have to go in order as far as Thanksgiving and then Christmas. Your kids will remember these sweet times of spontaneous fun:)Have fun settling in and making memories! So glad I’m not the only one ready to trim the tree! Thanks Kimberly! Love that song. Oh my love the turkey in disguise plan! Just been getting caught up on your blog :). Love how you treasure life. Awe the turkey is TOO cute to eat it was perfect strategy! I would be ready to put the tree up put I’m afraid the five cats would have more fun with it then me. I am totally not ready to see the snow we get with it though. So funny Erin! I had Christmas music going the day after Halloween and today was a Christmas movie marathon due to me and my little girl being sick. The holiday season is the best!